Sculpted Cocobolo PakkaWood handles and Tsuchime style blades create a stunning knife series that is sure to be a conversation starter. Micro Carbide MC63 powdered steel blades are hammered, shot blasted and hand polished to a dramatic finish. CRYODUR® vacuum tempering & the three-step Honbazuke honing process ensures a cutting performance that rivals its extraordinary beauty. The traditional Japanese D-shaped handles are made of Masur Birchwood; famous for its warm tone and richly rippled grain. The elegant blade is formed as 101 layers of steel are precision ground to expose a beautiful flower Damask pattern and the wavy Katana edge exposes a cutting core of ultra-hard Micro-Carbide MC63 powdered steel. CRYODUR® vacuum tempering & the three-step Honbazuke honing process ensures long-lasting cutting performance. Black linen Micarta D-shaped handles unite with authentic blade shapes for the definitive Japanese knife series. Exquisite Damask-style waves are revealed as 64 layers of polished stainless steel wrap the blade’s razor sharp CMV60 core. CRYODUR® vacuum tempering & the three-step Honbazuke honing process ensures long-lasting cutting performance. A fusion of western aesthetics with authentic Japanese blade shapes. 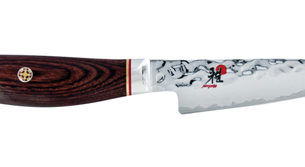 Thin razor-sharp edges make the precise and intricate cutting motions used in Japanese food preparation easy. A cutting core of Micro Carbide powdered steel is enclosed within 132 layers of stainless steel that is CRYODUR® ice-hardened, ground and polished to reveal an elegant Damascus pattern. 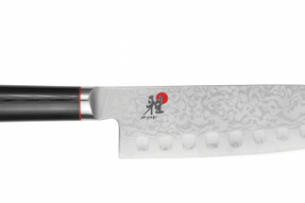 Like Chef Masaharu Morimoto’s culinary style, these knives are a fusion of traditions: Japanese style blades with a Western 3-rivet handle design. Exquisite Damask-style waves are revealed as 64 layers of polished stainless steel wrap the blade’s razor sharp CMV60 core. CRYODUR® vacuum tempering & the three-step Honbazuke honing process ensures long-lasting cutting performance.